Visit a scenic UNESCO World Heritage Centre on a full-day tour of Pamukkale and Hierapolis from Antalya. Soak in mineral-rich hot springs formed from white travertine, then visit the ancient sites of Hierapolis, which stretch from the Attalid kings to the Eastern Roman Empire. This full-day tour includes breakfast, lunch, entrance fees, and round-trip transport from Antalya. Get an early start on the day with 6am pickup in Antalya, then begin the 150-mile (240-km.) trip to Pamukkale, with a stop for breakfast in Korkuteli (breakfast is not included in the price of this tour). Upon arrival at the Pamukkale Thermal Pools, slip into your bathing suit for a soak in the natural hot springs. 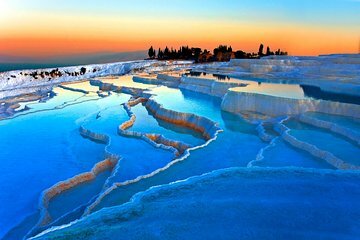 The travertine terraces have been popular since ancient times, and they make up an otherworldly landscape—Pamukkale is known as the “cotton castle” in Turkish. From Pamukkale, continue to Hierapolis to see the remains of Attalid and Greco-Roman settlements. Visit the Roman Amphitheater and other excavated ruins, with the option to visit Cleopatra Pools, a warm spring with historic stones just beneath the surface of the water (entrance fee to Cleopatra Pools not included). Browse for souvenirs at the vine and textile factories, then pause for a buffet lunch. After lunch, you can head to Red Water, a section of the springs that flows across brightly colored stones (entrance fee to Red Water not included). Make a final stop for a buffet dinner before starting the return trip to Antalya, where this tour concludes with drop-off at roughly 9pm. This is one of the more expensive tours from Antalya to Pamukkale. However, I booked it based on the description/details and hoping that the quality of the tour would compensate for the higher price. What they did not mention at all in the description or itinerary is the multiple shopping stops they would make. The bus stopped at so many shops that the tour should be renamed Shopping tour Antalya-Pamukkale. We ended up spending much more time in the stops than at the famous Pamukkale itself! Besides the stops, the tour guide was very good, had a lot of knowledge about history and described the places well. The price covers lunch and dinner. Lunch was alright - however the dinner place was perhaps the Worst place one could imagine. The food was not only really bad tasting, it was unhygienic as well with insects on the dishes. Many other travelers were very frustrated with the quality as well as not being allowed to have their children be able to eat anything on the bus !!! Overall, an extremely disappointing tour. But the place Pamukkale itself is wonderful and worth a visit. The experience would be very pleasing if you can get a local tour from one of Antalya local hotels/guides.